First, let me state that both Blue and Dungeness crabs are worthwhile. These are not ghetto crabs, like I once ate in St. Petersburg outside a Rays' game until the fact that their flesh was black and oozing bothered me. 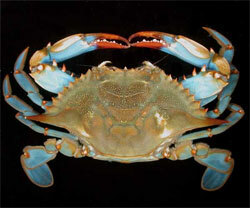 Blue and Dungeness are, along with Florida's stone crabs, the finest crabs America's Lower 48 have to offer. They're as good as the best crabs anywhere in the world, including zuwai gani in Hokkaido and king crabs in Alaska. Europe has world-class oysters, but it doesn't have crabs this good. Blue crabs have more flavor; they're sweeter. 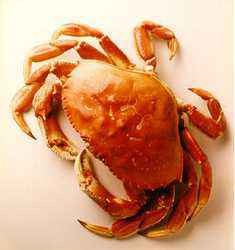 But Dungeness crabs are much bigger, giving up bigger chunks of meat for less effort. Their size opens them up to some great San Francisco cooking techniques, including roasted with garlic or "drunken" in black bean sauce, whereas with blue crabs, the perfect method of steaming them with Old Bay or similar seasoning cannot be improved on. Trash talking the other coast's crabs is like trash talking the other team's Harbaugh. There's more respect than disdain. This should make the annual Super Bowl bet between mayors fairly evenly matched; it's not like a bushel of crabs up against 5-way chili, cheese curds, or a sandwich with fries and coleslaw in it. I doubt that you'll find a crab lover in either Baltimore or San Francisco who wouldn't totally enjoy a meal of the other side's crab. But there is one area where this match is one-sided, and that's the crab cake. The easy victor is surprising. Baltimore has always been a blue-collar town. San Francisco has always been ambitious, often to the point of arrogance. SF is the city that fancies itself the center of the culinary world, whereas B-more is a place where the best crab meals are in bars with no wine list and a waitress who calls you "hon." So if you were to name a city that tries to stretch crabmeat, to make a single crab serve dozens of patrons, you might guess the city of "The Corner" and "The Wire" and "Homicide: Life on the Streets." A city where getting by rather than getting angel investors has been the order of the day. 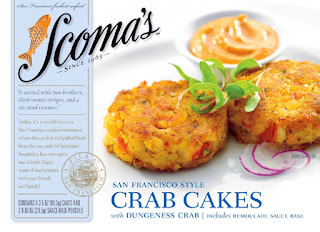 San Francisco does not understand the crab cake. The pathetic patties of breading with wisps of Dungeness served here are an affront to the crustacean. They're often served with sauce in an attempt to give them the flavor they lack. Why not just have a piece of deep-fried toast and some remoulade, and get a crab claw on the side? That would be tastier. I've never understood this. It's like when San Francisco taquerias take a perfectly good Mexican street food, the burrito, and stuff it full of rice, avocados, sour cream and fire-roasted tofu so that it's a gut-busting starch bomb with little flavor from the supposed main ingredient. You'd think a wealthy, gourmet-friendly city like this would value freshness, flavor and purity over volume and price performance, but in certain areas, there's a blind spot, and crab cakes are one. When I first moved to San Francisco, I quickly loved the softshell crabs. I don't know where they source them, and why they're a year-round product here even though crabs only molt during a very short, specific time (in Baltimore, soft shell crab season is less than a month long). But they're pretty good. I learned to love Dungeness crab and I eat plenty of it. But crab cakes? At least some restaurant workers know what a disgrace they are here. Usually if a server recommends crab cakes to me, I'll just say, "I'm from Baltimore." Those who haven't been there will keep talking. Those who have will just say, "The salmon is good." Spent a lot of time in Baltimore, now live in sf, and I totally agree. Completely agree on the crab cakes. I like Dungeness crabs, but do miss the experience of sitting on a porch with a newspaper covered table, bushel of crabs and cold beer. A couple of STEAMED not boiled dungie and a bottle of pinot blanc and I’m in heaven, but then I’m from the west coast, in my experience those blues, unless softshelled are more work than meat and who eats crab cakes when you can dig into the whole crab? Truth up brother. 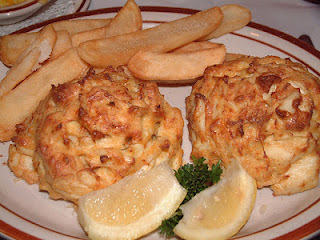 I spent a good portion of my childhood in the DC area where Maryland style crabcakes rule. I don't know why I even bother ordering crab cakes on the west coast, but there is the occaisional instance when they're actually good. When I order crab cakes out here my wife often asks, "Why do you torture yourself? You know you're going to hate them." Hate to say it...but the Super Bowl is in New Orleans. IMHO, best food in the country. But me blind in a restaurant and give me a menu and wine list. Only city I could be 100% certain I was in is New Oreleans. Sweetbreads, other organ meat, Oregon Pinot and Burgundy. I'd go any day of the week. I won't go so far as best food in the country, but I have gone to New Orleans just to eat, drink and be merry. You feel too guilty to eat that heavy food anywhere else in the US. But New Orleans is a guilt-free zone. Since you mentioned AK king crab, I have to say, if you didn't catch it yourself, you are eating a poor imitation. Fresh king crab is so good that butter defiles it. All king crab in the lower 48 is pre- cooked and most likely frozen.